Rip Hunter’s band of time travelers aren’t the only heroes appearing in Legends of Tomorrow. Over the last week, DC Comics has been announcing classic heroes that will be gracing the CW series. The latest character to be teased is actually one of the few visually impaired superheroes, thus providing some healthy competition to Marvel’s Daredevil. 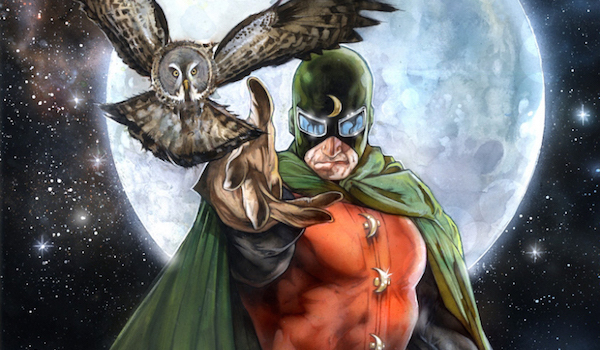 That’s right, Doctor Mid-Nite is coming to Legends of Tomorrow. The original blind vigilante, this hero sees perfectly in pitch black and uses blackout bombs to block light. Screenshot this image and use filters to reveal the answer, and share your findings with #LoTEasterEggs! Thank you for following along with our #LoTEasterEggs, and don't forget to check out @cw_legendsoftomorrow: Thursday at 8/7c on The CW. Although Mid-Nite wasn’t seen in the post on DC Comics’ Instagram page, he was represented by one of his classic blackout bombs, which emit a black gas that clouds his opponent’s vision. The post’s line about Mid-Nite being the “original blind vigilante” is also accurate, as Doctor Mid-Nite debuted in 1941, while Daredevil wouldn’t grace the printed page for another 23 years. So even though Matt Murdock’s done a commendable job of keeping Hell’s Kitchen safe, and is, arguably the more famous one, Mid-Nite’s been at the superhero game longer. Doctor Mid-Nite is also the fourth Justice Society of America member that’s been announced for Legends of Tomorrow, following the Ma Hunkel Red Tornado, Hourman and Sandman. There have been three versions of Doctor Mid-Nite in the main DC universe. The first was Dr. Charles McNider (heh, name play), who was one of the original members of the Justice Society. In the 1980s, Beth Chapel briefly wielded the identity until she was killed in battle. The second most famous Doctor Mid-Nite was Pieter Cross, who joined the modern JSA as their main physician. All of them were blinded in accidents, but they gained the ability to see perfectly in the darkness. With the aid of special goggles, they’re able to see in the light as well. McNider and Cross also use trained owls as sidekicks to aid them with taking on the bad guys. Doctor Mid-Nite previously cameoed in the animated shows Justice League Unlimited and Batman: The Brave and the Bold. Legends of Tomorrow airs Thursdays at 8 p.m. EST on The CW.